John Dunaway surveys the land of his creation. There's the countryside, lush and green. To his right, a quaint town blooms on the edge of a vast prairie. At the opposite end, rocky hills rise up above a water-fall generated lake. John's eyes fix on a small tunnel in the mountain-like wall. A familiar sound emerges. Seconds later, a train rushes into view. With his thumb, he brings it to a halt at the push of a button. "This one just came in from St. Louis," he says. John's working on a depot just outside town where his trains can park. 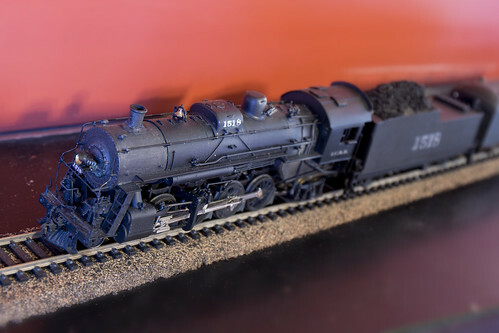 "It's always a work in progress," says John as he explains his passion for model railroading. "I worked a bit at the railroad, and my dad worked on steam engines. My uncles and cousins we all railroaders. So it's always been something I loved." John has seen many changes over the years in the railroad industry, something his modeling reflects. One of his newest locomotives is a model of the GE Evolution Hybrid, an engine that uses battery power to lower overall fuel consumption. "This particular model is of the demonstrator GE used to showcase the technology," says John. The model locomotive comes complete with sounds recorded from the actual engine including radio transmissions from the engineer. John's collection also dates back to the steam-powered days. His prize is a model of locomotive 1518, the engine on display in downtown Paducah. Attached are exact models of the car and caboose. "There were only 200 of these models made, and only two of them are in Paducah," he says. "I collect Paducah memorabilia as well, so when I found out about these, I had to have it for sure!" A lot has changed in the railroading world over the years, and John says a lot has also changed in modeling. "Everything has gone digital," he says. "I can control everything from one point. The sounds come directly from the trains, and I can control multiple trains and everything in the town such as lights, track switches, and starts and stops. Soon, I'll have everything connected to an iPad. I'll be able to record up to 90 minutes of activity in the town and play it back at any time." John enjoys the changes in technology, but his favorite part of the hobby is in old-fashioned modeling. "I like doing the scenery. Right now I am building a power plant system for the town. I also like doing bushes, trees, and rocks." John holds a small bag of greenery as he gives a demonstration in tree building. Like a man making cotton candy, he rolls a small, glue-dipped twig in the greenery, instantly creating a tree. "I can spend a long time up here doing things like this," laughs John. "This is what I want to do when I don't want to work. And I never want to work!"